Communication is the key to understanding one’s peers, yet sometimes it can be the hardest thing to do. Everyone has been in the embarrassing situation where the right words just won’t come out, and the discussion seems to be going nowhere. Fortunately, experts Kevin Hogan and Ron Stubbs have the solutions that will prevent such situations from arising. 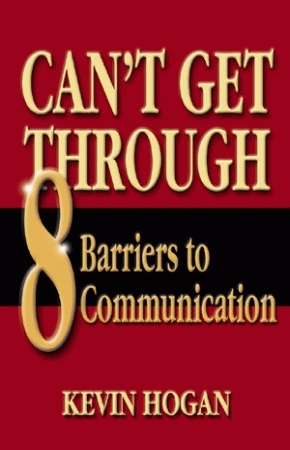 They identify the eight most common mistakes and offer suggestions on how to prevent being trapped in a communication barrier. These mistakes include making bad first impressions, failing to listen, giving unnecessary criticism, being overly argumentative, and ignoring the cycle of communication. The authors include examples and suggestions that illustrate the proper tactics for improving one’s communication skills, providing strategies that may be used in the office, at home, and in social situations. The best news is you won’t ever have to be in such an awkward communication predicament again. As a practicing certified clinical hypnotherapist and instructor, Ron Stubbs has helped clients of various ages with a wide range of problems, including fibromyalgia, depression, and abuse issues. He is a nationally recognized public speaker and corporate trainer. Mr. Stubbs is a resident of Camano Island, Washington. Kevin Hogan holds a Psy.D. in psychology. His expertise in the field of human influence has made him a sought-after speaker and teacher worldwide. He is the author of Selling Yourself to Others: The New Psychology of Sales, Talk Your Way to the Top: Communication Secrets to Change Your Life, and The Psychology of Persuasion: How to Persuade Others to Your Way of Thinking and coauthor, with Mary Lee LaBay, of Through the Open Door: Secrets of Self-Hypnosis, all available from Pelican.